The transition of going from a supposed wannabe-GTA clone to a full-fledged standalone, open-world MMO has been a long and hard road for All Points Bulletin, one of the few games that have died and resurrected bigger and badder than before. The latest trial for Reloaded Productions is overhauling the game's core engine to something newer, faster, bigger and better... the latest rendition of Unreal Engine 3. A few months back we reported on Reloaded making the transformation for APB: Reloaded from the old and ugly version of the Unreal Engine 3 to the newer and fresher version of the Unreal Engine 3. Reloaded has slowly been making updates on their progress, like the one they recently made not too long ago on their blog. Not too shabby. My biggest concern is with the character creation porting... how well will the characters make it over? 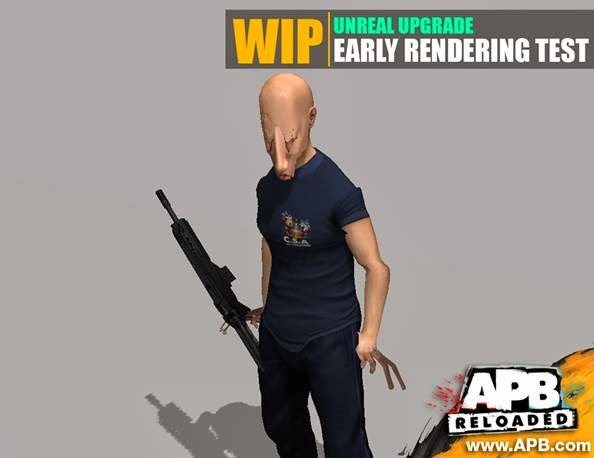 The blog talks about how the bone structure differs in the way Realtime Worlds built the characters in the original APB is different from how the latest Unreal Engine 3 handles bone scaling. Due to this, I am a bit skeptical as to whether or not custom characters will make the transition in a 1:1 factor that maintains similitude to how they are right now in the game. Of course, we won't know for sure until the conversion is complete, but for now, here's how the first iteration of the models look going from the standard APB: Reloaded structure to the new UE3 pipeline. On the upside, at least the game is functional and it works. This means that the kind of features gamers have been clamoring for will finally be possible: potentially higher player-counts, better lower-end optimization for older computers, better graphical effects, faster loading, better streaming and more content scaling. I can't wait to see how it all turns out when the conversion is complete. 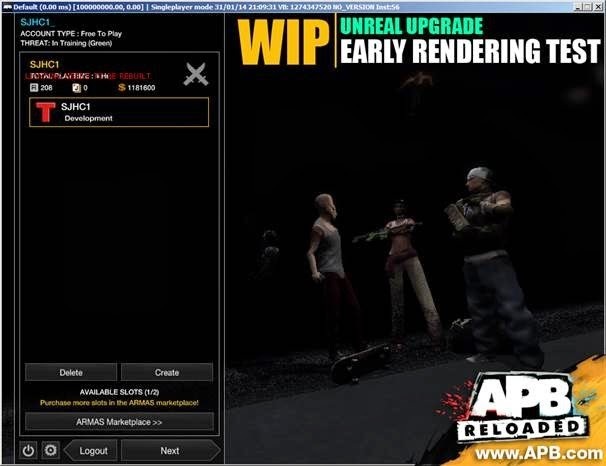 In the meantime, you can stay updated on the progress by keeping an eye on the APB Reloaded blog.